The recent visit of the US President Barack Obama and the First Lady Michelle Obama was reason enough for the Indian media to remember the Presidential visits of the past. It was heartening to see the photograph of First Lady Jacqueline Kennedy in the Sunday edition of The Economic Times. The photograph shows the First Lady along with my father, His Highness Maharana Bhagwat Singh, sharing a light moment. It was a private visit of the First Lady to Udaipur. 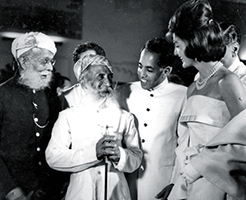 The photograph, printed in The Economic Times, is dated March 17, 1962; it captures the reception at Fateh Prakash Palace in honour of Ms Jacqueline Kennedy. The Royal Family-Members, and members of the extended clans of Mewar, were present at the reception. We still recall the days she spent in Udaipur and her visit to Jagmandir, the island-palace on Lake Pichola.